BERKELEY — Behind the rapid modernization of China, powerfully symbolized by the architectural wonders of the Beijing Olympics, are millions of migrant construction workers from rural villages working for low wages and outside the protection of Chinese labor laws. Few beyond the People's Republic are as intimately familiar with the workers in this equation — their second-class citizenship status, their workplace safety hazards, the holes in their social safety net — as UC Berkeley student Julia Chuang. A fourth-year doctoral student in sociology, Chuang spent months at construction projects in Beijing, interviewing and observing the steelworkers, cement pourers, carpenters, electricians, and plumbers who — beam by beam, floor by floor — are constructing the new China. "A huge pool of migrant labor from the countryside is basically subsidizing urban development" in a virtually unregulated construction industry, says Chuang. When workers are needed at an urban construction site, a subcontractor, say, in rural Hunan or Sichuan province will receive a call: "'Be here tomorrow at 5 a.m.; we have a place for you to sleep.'" The next morning his crew of 10 to 40 men, some as young as 14, others into their fifties, will show up at the work site, where they'll each average $200 a month (about a third of what their urban counterparts command) while living onsite in close quarters provided by their employers. The dormitory is relatively quiet today; most workers are fast asleep, particularly the concrete pourers. They are stripped down to their underwear in the heat, laid out on beds and pieces of wood or dirty Styrofoam on the ground. On Sunday, Beijing city officials will be coming over to inspect the building. If the building passes city qualifications, then Company 3 will receive over 2,000,000 yuan in award money for winning the "Great Wall Cup," a status awarded to the city’s highest quality construction development sites. Several of the Olympic buildings on the edge of the city are shoo-ins for the Great Wall Cup, and the Tsinghua construction site stands a good chance of qualifying. Yesterday morning, the boss held a meeting with all of the foremen on the construction site to go over the details of Sunday’s inspections. Each foreman was instructed to have his workers work meticulously for the next three days, checking over all measurements as they go. Migrant workers' vulnerability under this system is tied to the two tiers of citizenship that began under socialism and remains essentially in place today, says Chuang. As part of the nation's industrialization strategy, citizenship status was based on place of birth. Those born in the countryside had rural citizenship, city-born Chinese had urban citizenship — and one's state-provided social benefits (from medical insurance to daycare, severance pay, and old-age pensions) depended on one's citizenship status. Rural peasants, the thinking went, always had their agricultural land to fall back on for survival; urban workers in state-run enterprises, meantime, needed more generous helpings from the "iron rice bowl" of the state. This two-tier system has become problematic for the state, says the Berkeley researcher, as separation between rural and urban populations has broken down. Movement outside one's place of birth was tightly controlled by the Chinese government under socialism. Following the loosening of those regulations in 1978, millions of peasants from the countryside have come to the cities in search of work and higher wages. Rural and urban citizens now find themselves doing the same kind of work in close proximity, "but under very different state protections." Social benefits for rural citizens, she says, still "pale in comparison" to their urban counterparts'. Chuang notes that the use of vulnerable migrant workers, employed under substandard conditions, is a global phenomenon — from Japan and Dubai to South Africa to the United States, and that current guest-worker proposals in the U.S. "would similarly give low-paying seasonal jobs to non-naturalized workers," many of whom "will never be able to gain citizenship." 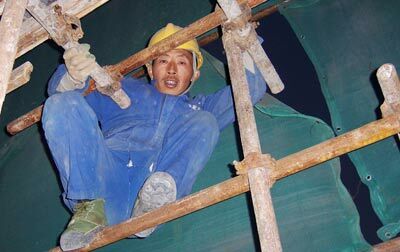 At two construction sites in Beijing, Chuang observed construction workers as they did metal welding without eye or hand protection and climbed perilous scaffolding without safety harnesses. Accounts of workplace injuries were not uncommon. One man she interviewed had been paralyzed when he was impaled in the neck and shoulder by a metal scaffolding pole. (His hospitalization was paid for by his subcontracting firm, but he received no disability to help him provide for his wife and aging mother.) Another worker described the fate of an inexperienced colleague who was injured in a fall from unstable scaffolding, then was docked the price of his tools and half his pay (for failing to complete the work term). Non-payment of wages is chronic in the industry, says Chuang. Chinese construction workers are paid only after a building has been completed and inspected — by which time they've returned home to the countryside or moved on to the next project. Wage payments can be made through post-office services — but "almost everyone you talk to has had an experience of laboring for six months and not being paid and having no recourse," Chuang says. "Where there are labor infractions, such as unpaid wages, it's difficult for migrant workers to find any means of appealing." According to reports by the Xinhua and JinYang news agencies, as of 2007 more than 124,000 completed construction projects in China owed 175.6 billion yan ($24.8 billion U.S.) in unpaid wages to migrant workers. State-owned construction enterprises accounted for more than $9.2 billion of the total, according to Ministry of Construction figures. A new labor-contract law took effect in mainland China this January. It sets a minimum wage, limits overtime, and provides laid-off workers with severance pay based on each year worked. These regulations are being implemented fairly quickly, if unevenly, in China's factories, notes UC Berkeley researcher Julia Chuang. The law ostensibly applies to all workers, rural and urban. But migrant construction workers — because of the complex system of subcontracting and the temporary nature of the work — aren't seeing the benefits of the reform, she says. Social scientists often immerse themselves in the lives of those they are studying as "participant observers." Chuang, as a woman and a U.S. citizen, was unable to get a construction job in China. Instead, the 26-year-old Denver native, whose parents hail from Taiwan, teamed up with fellow graduate-student researcher Qi Xin from Beijing's Tsinghua University. Because construction in Beijing typically goes on 24/7, the two women were able to enter work sites at night, plying guards with American cigarettes and "swift talk" and hanging out on a cement floor or scaffolding to observe and talk with workers. Chuang, who learned Mandarin as an undergraduate at Harvard University, did many hours of research, as well, in the on-site dormitories where workers — some with wives and family members in tow — eat, sleep, and spend their down time. With UC Berkeley Professor Michael Burawoy as her research adviser, the sociology grad student is investigating the relationship between Chinese migrant workers and their rural villages back home, and whether and how these workers conceive of themselves and band together as a working class to protest unpaid wages and other labor infractions. The National Stadium, or "Bird's Nest," and the dazzling new headquarters of China Central Television (CCTV) — "so architecturally amazing, so innovative — embody the ambitions of the Chinese state, looking to the future as a new world power," says Chuang. Most of the steel workers she interviewed helped to build the stadium; others worked on CCTV and Beijing's Tsinghua Science Park, an opulent office complex where Google and many other international corporations have their China headquarters. Migrant construction workers proudly display, on their cell phones, photos of the wonders they've helped build — "under very precarious conditions for very low wages because of their non-citizenship status and their vulnerable position," notes Chuang. The Chinese state has "always turned a blind eye" to the vulnerability of migrant workers, she says, "because this is how you fuel industrialization for so cheap and at such a fast pace."